The Centennial hiking trail is wanderlust’s utopia. Beginning at the Jeff Friend trailhead, the sandy gravel path lasts a short distance before a boardwalk transports you into a more secluded area. The two mile hike is a moderate hike and can take up to two hours. The path is sandy, therefore it is recommended that closed shoes be worn for the best hiking experience. 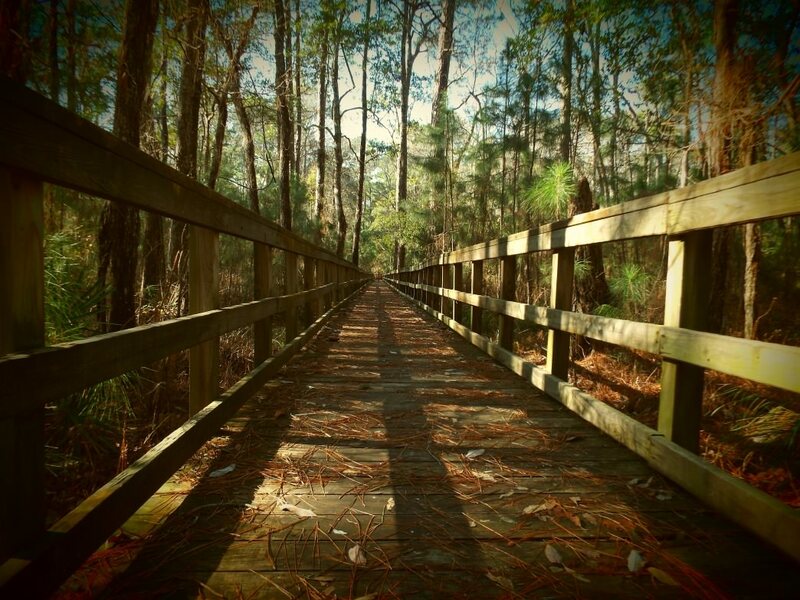 This trail leads deeper into the Bon Secour National Wildlife Refuge where it is shaded and surrounded by dense trees and undergrowth for most of the hike. The Centennial Trail ends at the Pine Beach Trail where those wanting a longer hike can continue. Unlike the other trails, the Centennial Trail is remote and quiet. The winding boardwalk is the most lengthy of all the boardwalks within the refuge deluding visitors that a waterfront or highway is near. Most wildlife is nocturnal but prints left behind in the sand are indicators that fox, coyotes, and bobcats roam the refuge. If you are looking for a peaceful spot to reflect often filled with various bird calls, then the Centennial Trail will be perfect for you. The boardwalk provides a sauntering stroll with the freshness of the forest pines, the beauty of the live oaks draped in Spanish Moss, aromas of Southern Magnolias, and the ghostly white trunks of the Sycamores mysteriously protruding from the darker evergreen forest foliage. No pets are allowed within the Bon Secour National Wildlife Refuge. Directions to the Centennial trail begin from the intersection of AL 59 South and AL 180 West. Traveling 6 miles westward on AL 180, the parking lot is on the left hand side. The Jeff Friend Trail sign marks the gated entrance. The Centennial Trail begins close to the Jeff Friend trailhead. There are no fees and the trail is open only during daylight hours.